At Microsoft Ignite 2018, Microsoft introduced a new self learning service named Microsoft Learn. At the moment, it includes some self learning courses and learning paths for Azure, Dynamics 365, PowerApps, MS Flow and PowerBI. Judging by various off-the-record comments, Microsoft intends to expand this course list in the future. – All content is organized by a learning path, giving you an end-to-end view of a technology area and ensuring that you build a comprehensive skillset. – Learning paths consist of step-by-step tutorials with interactive coding environments that provide free fixed-time access to Azure resources – without requiring a credit card. – As you use Microsoft Learn, you can track progress, check knowledge, and validate deployments to earn points, levels, achievements, and trophies. I have been taking various courses now for a few days, and I must say Microsoft Learn is a welcome addition to Microsoft Docs. Although the list of available topics at the moment only covers a few Microsoft products, it already has over 80 hours of content. 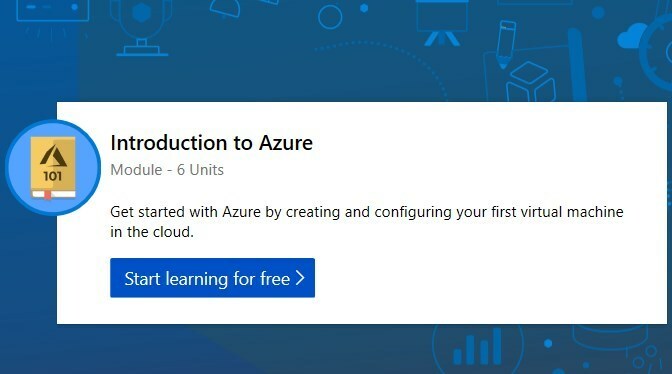 The approach is clearly “Azure first.” In fact, I suspect that Azure will always be a platform with more learning paths and courses available on MS Learn than any other products or platforms. I believe this is a positive thing, though, because Azure and cloud computing are subjects that each and every IT professional must learn. Although I already have some basic knowledge of Azure, over the past few days I have tackled some courses as a beginner, as if I had no previous knowledge. Following these courses, I have created my first web server on Azure, set up a WordPress blog on an Azure Linux based server, and created Azure virtual machines, as well as scaling up those virtual machines. Microsoft Learn splits its web UI (browser tab) into two panes, showing the text of the module you are currently going through and the Azure Cloud Shell simultaneously, side-by-side. This allows a user to read what he / she is supposed to do next, then without opening new programs or browser tabs to perform those steps by him / herself in the cloud shell. Everything is sandboxed, and free; there’s no danger in making mistakes, nor are there any costs for user. Take the Microsoft Learn tour to see its interface and various options. I strongly recommend that you take a look at Microsoft Learn. It is an easy and comfortable way to introduce yourself to some (and hopefully, more and more) Microsoft products. Learn the terminology, and see for yourself how to do and manage various tasks. Microsoft Learn is not only cool, it is also quite a practical tool for self learning. And, best of all: it is completely free!